Destiny Dance Studio in Littleton offers ballroom dance lessons where you can learn all the popular dances. 5 Nights a week we offer beginner through advanced group dance classes in Littleton, CO in at least the 6 major types of social dance. The holiday season is just around the corner. Give someone you love the gift of dance this season! Purchase a dance certificate from our Littleton studio today. If you have questions about our classes and/or Littleton studio near Highlands Ranch, feel free to give us a call at (303) 738-5542 or email us at Startdancingtoday@mydestinydance.com! 2) If you are enrolling just for yourself (or you and one partner) simply click on “Book” and follow the prompts to enroll. If you plan to enroll yourself (or you and your partner) IN ADDITION TO another couple or single guest, CLICK HERE to be directed to our main calendar page where you will be allowed to book for multiple clients by navigating to our Classes tab, selecting “Sign up Now” for the class you wish to book, enter your current login information or create a new login, then Under the “Make a Reservation For:” Select the radio button labeled “someone else” and follow the instructions to check out. 4) Sit back and bask in your own awesomeness, you’ll be showing off your slick moves in no time! Check out all the group dance classes we offer in Littleton, CO! Beginner Dance Classes: Beginner’s classes focus on the basic introduction to the dance and its patterns. This class is meant for the novice dancer. Intermediate classes cater to dancers who have limited previous experience in the dance style for that month. We focus on increasing pattern knowledge and begin basic technique specific to that dance style. Our technique based group dance classes in Littleton, CO are for those dancers familiar with the dance who are looking to gain a better knowledge of how a dance moves, feels and looks. These classes are designed to bring a heightened awareness to movement, body control, and musicality and benefit dancers in all ballroom dance lessons. Saturday Nights are all about FUN!!! These dance evenings are open to the public, we feature a one-time group class at 7 pm each evening and from 8-10 m we offer general dance including great music for all the dance styles offered. There is no doubt that you will have a good time joining one of your group dance classes in Littleton, CO. However if you are not sure about group classes we also offer private lessons for you or you and your partner, you can give it a try because the first private lesson we offer is free. 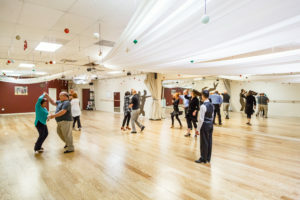 Our Littleton dance studio is conveniently located so that if you are in any of the Denver Metro Area you can join us for our ballroom dance classes.